I have been wanting to do this for a long time; Running OS X emulated on my Linux workstation. Mostly for testing, compiling, trying out things. When someone calls and wants help setting up his Mail.app, it is very useful for me to see how the menus, etc. look. 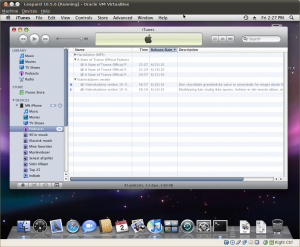 Found an iPC 10.5.6 iso that installed in latest VirtualBox without any problems at all.